EU Regulations introduced during 2011 has heavily regulated lead additives to paint products and as such, the manufacture of modified polyurethane paint is being phased out by many suppliers as they are now only permitted to use up existing stock of ingredients. These paints have now generally been replaced by other products, which many consider to be inferior in terms of ease of application and desired finish. 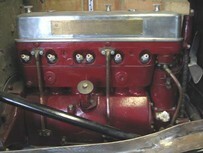 Mixed for Vintage MG Parts and currently available in Red, Mid Blue, MG Racing Pale Blue, Green, Burgundy and Black. This product is designed specifically for engines and retains high heat resistance as well as petrol and oil resistant qualities. Please note, this is not a standard 'yachting' paint. 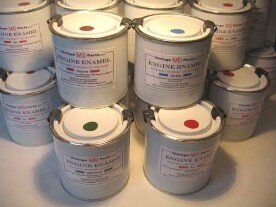 We are fortunate in being one of only a small handful of distributors in the UK to be able to sell new old stock engine paint containing lead dryers. Modern substitute paint products cannot replicate the effect that lead dryers has in producing paint which is rich in pigment and hard-wearing with a high gloss finish and excellent heat resistant qualities. However, please see the warning below. Ideal for the concours rebuild. Easy brush application or can be sprayed and best applied over an initial etching primer coat. Allow 24 hours drying before a second coat if applicable. (250 ml tin - sufficient paint quantity for 1-2 MMM engines with 2 coats and can also be thinned by up to 10% with fast high quality cellulose thinners). WARNING: this paint product contains lead dryers and should be applied in a well ventilated space and a face mask should be worn.